Say-Now is "Wow!" software. Begin telling your computer what you want it to do. Say-Now is voice recognition software to command and control your computer. Reduce or eliminate mouse clicks or keyboard input. It can enhance your computing experience by providing an additional input to the computer. Use it to open websites, documents, or programs just by speaking. Perform navigation and editing functions simply by speaking. Begin taking control of your PC now using your voice. 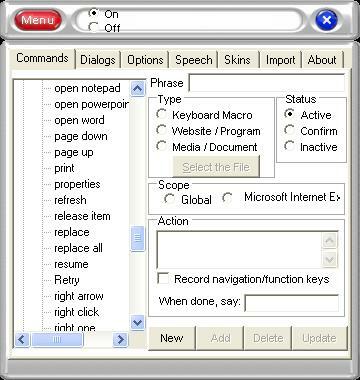 It features a rich set of predefined voice commands and is based on the latest Speech Accessibility technologies from Microsoft. Includes synthesized speech prompts and cues to let you know what commands were executed. The program is very small and easy to use.